﻿﻿A Lake Buchanan weekend provides recreation and a chance to glimpse our national bird. ﻿﻿﻿﻿﻿﻿﻿﻿﻿﻿﻿﻿﻿The battle between the turkey and the bald eagle as the national symbol has long since played out, and the bald eagle is clearly running the show. Here’s evidence: On a trip to the Lake Buch­anan area the weekend before Thanksgiving, my family and I stayed at the Canyon of the Eagles resort, shopped for eagle souvenirs, took a boat trip to watch for eagles and visited a well-known roadside bald eagle nest. A few days later, on Thanksgiving, we chowed down on a bunch of turkey, as did millions of other Americans. Benjamin Franklin famously wanted the turkey to be the national symbol, saying the bald eagle is a bird of bad moral character and a scavenger, while the turkey is a true native bird and a bird of courage. The founding fathers, though, looked past the eagle’s shortcomings and saw the bird as a symbol of strength and freedom. Sorry, Ben. The turkey is a tough sell. At Canyon of the Eagles, turkeys actually outnumber eagles, which reside there for just part of the year anyway. But Canyon of the Turkeys just doesn’t sound as appealing. People come for the eagles. ﻿Symbol of freedom or scavenger? The bald eagle is both. 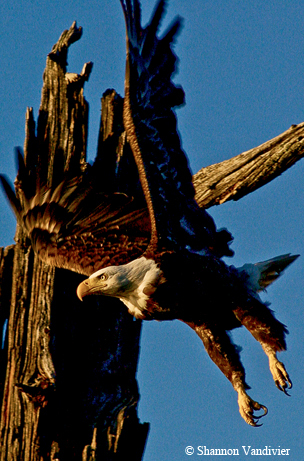 This eagle takes flight at Lake Buchanan. We came for the eagles, too, and for the numerous other attractions at Lake Buchanan, the uppermost lake in the chain of the Hill Country’s Highland Lakes. As we drive, my kids lighten the mood with some jokes from a joke book they brought along. Jokes ended up punctuating several of the events of the weekend. Q: What happened when the teacher tied all the students’ shoelaces together? A: They went on a class trip. Q: What’s the best way to revive a dying rodent? Our first stop is Longhorn Cavern State Park, one of the oldest state parks in Texas. We buy tickets for an afternoon cave tour, giving us time to wander around the grounds and buildings developed by the Civilian Conservation Corps in the 1930s. I love the rockwork of the former headquarters building, which was built with native limestone and crystal formations from the cavern, and I always make it a point to admire the well-crafted and artistic work done by the Depression-era job corps. To me, Longhorn Cavern is more interesting for its human history than for the beauty of its formations. It doesn’t have a lot of highly decorated rooms that you might find in other caves, but it has no peer in terms of human interaction. Our tour guide tells us that the cave has been used as a shelter since prehistoric times. Comanches used it as a place to make tools, and the Confederate army used bat guano from the cave to make gunpowder during the Civil War. Several outlaws, most notably Sam Bass, are thought to have made use of the cave. In the 1920s and ’30s, the cave was used as a nightclub and dance hall. Concerts are still held there — the Lake Bottom Jazz Trio was scheduled to play a few days after our visit. One of the best-known formations is the Queen’s Watchdog, which appears to have four legs, a body, a tail and a snout. Our tour guide matches the corniness of my kids’ jokes with one of her own. Q: Does anybody know what kind of dog this is? 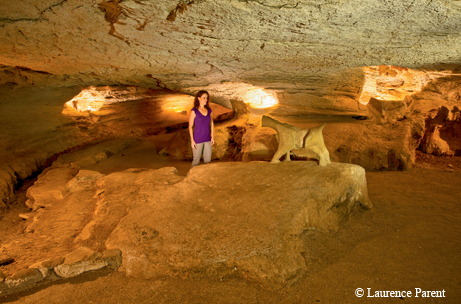 ﻿﻿At Longhorn Cavern, cave formations, including the Queen’s Watchdog, are on display. After the tour, we head to our weekend’s lodging at Canyon of the Eagles, a nature park and resort on the shores of Lake Buchanan. Owned by the Lower Colorado River Authority, it offers lodging, a restaurant, a campground, trails, lake recreation and an observatory. I’m hoping to get there before sunset, and we arrive just in time to see the sun drop below the horizon from the bluff overlooking the lake, which is still suffering from drought. The impending darkness means the monthly “star party” will begin soon, and after dinner at the restaurant, we make our way out to the Eagle Eye Observatory. Once a month, the Austin Astronomical Society hosts a “star party” where members set up telescopes and invite the public for an evening of stargazing. As I get out of the car, I’m immediately struck by the presence of the Milky Way, the luminescent river of stars stretching across the sky. Club members welcome us to look through their telescopes, and show us such wonders as the Northern Cross, Pegasus, Jupiter, the Orion nebula and, fittingly, the eagle constellation Aquila. The next morning brings us to the Vanishing Texas River Cruise, which takes passengers around Lake Buchanan to enjoy scenic views and look for wildlife, especially birds, and super-especially, bald eagles. Texas has resident bald eagles that live in the state year-round, mostly in East Texas and along the coast. Winter brings migrating eagles from the North to other parts of the state. Back when bald eagles were on the brink of extinction, in the 1970s, Texas had only seven known nest sites. Thanks to recovery efforts, 117 active nests were identified in the Texas Parks and Wildlife Department’s 2003 survey. Cruise passengers always hope for a bald eagle sighting, but it’s never a guarantee. On our cruise, we have other raptors to hold our attention. 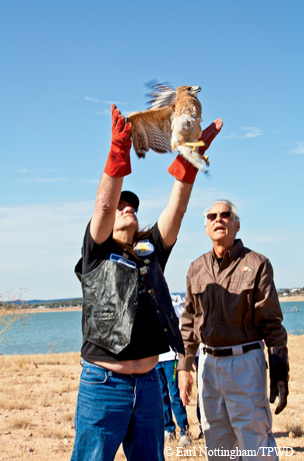 The Vanishing Texas River Cruise regularly teams up with Last Chance Forever, a raptor rehabilitation group, to release rescued birds back into the wild on what they call the Freedom Flight Cruise. On our cruise, Last Chance Forever has brought four birds to release, and despite my cajoling, the staff members won’t drop any hints about what they’ve brought aboard. The first bird turns out to be an American kestrel, a migratory bird that is North America’s littlest falcon. This one had been found injured in the Dallas area. An 11-year-old passenger is picked to release it. He puts on thick gloves to protect his hands from the bird’s sharp talons. Standing on a bench at the back of the boat’s upper deck, surrounded by passengers filled with anticipation, he flings open his arms to release the kestrel. The open arms represent a new beginning for the bird, and his wings take him across the water toward the shore. After a second kestrel is released, on a Lake Buchanan island, the rehabilitators bring out a red-shouldered hawk that had been shot. They select Stefan Hill, a Vietnam War veteran, to release the hawk. “We consider this bird a wounded warrior,” one of the rehabilitators says. Hill had open-heart surgery six weeks earlier, and his wife booked this trip for him so he could see these magnificent birds that had been healed and perhaps get some inspiration for his own recovery. The red-shouldered hawk was an apt choice. “You both know what it’s like to be shot at,” his wife, Lynn, says. On the island, with arms outstretched, Hill lets the bird take flight. “It felt like when I got out of the hospital — freedom,” he says. ﻿﻿﻿Stefan Hill releases a rehabilitated red-shouldered hawk as part of a Freedom Flight Cruise. Back on the boat, with our patriotic fires stoked, we continue to cruise around the lake. And then, one of the boat’s crew sees it — a bald eagle. We watch as the eagle soars through the air and then alights on the top of a tree, next to another bald eagle. Mission accomplished. As the boat heads back to the dock, one last bird gets its freedom flight — a great horned owl. Once we get ashore, I call my uncle and aunt, who live in the area, to see if we can meet up with them. We were planning to see them at Thanksgiving in a few days anyway, but it’s always good to get in a little family time. My uncle is a Methodist minister, and he and my aunt had finished Sunday services and were wrapping up a post-church lunch with friends. He suggests we meet at the Dairy Queen in Kingsland, where I’ve met him before when I’m in town. On the way, we decide to make a little detour to check out the bald eagle nest off Texas Highway 29 near Llano. The nest sits high in a tree between the highway and the Llano River, and it attracts wildlife watchers from across the state. We don’t see any eagles, but the enormous nest, constructed of large sticks, is quite impressive on its own. For the last part of the trip, I leave my family behind and meet up with a friend for some mountain biking at a ranch I’d been hearing and reading about. 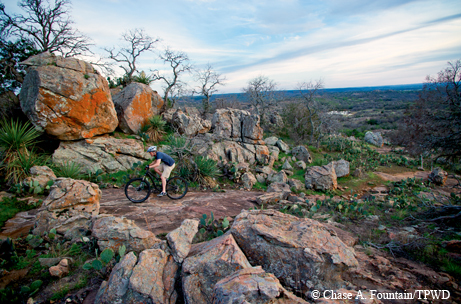 Reveille Peak Ranch offers Texas mountain bikers something different — the chance to ride on granite trails and formations. My friend and I plot a course on the map and take off. ﻿﻿﻿﻿Mountain biker Eric Krell tackles the granite trails at Reveille Peak Ranch. We wind through creek crossings, granite outcrops and prickly pear patches until we get to the top of the Flow Track, a downhill trail with a series of jumps, berms and banked turns. The zippy 1-mile downhill ride is a blast. After more riding, we decide to make the trek to the top of Decision Point, the highest spot on the ranch. We follow a jeep road, steep in sections, to the peak, which affords a beautiful 360-degree view of the countryside and Lake Buchanan. The grippy granite on top of the peak reminds me of Enchanted Rock. If you’ve ever wondered what it would be like to go mountain biking at Enchanted Rock, this place might be the closest you’ll come. On the ride out, I take a head-over-heels tumble that leaves me shaken but not broken. I’m able to finish the ride, and back at ranch headquarters, we decide to recover and relax by hanging out at the lakeside pavilion, having an adult beverage and watching some NFL football on the big-screen TV. The Eagles, believe it or not, lost.